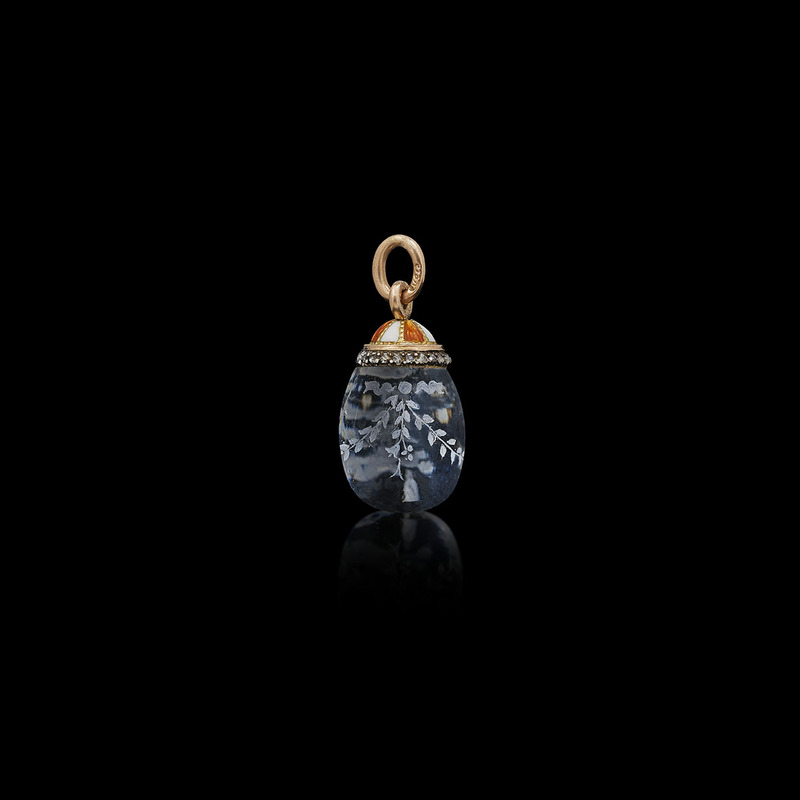 the body of the egg carved from a single piece of purest white rock crystal, the surface delicately engraved with foliate swags tied with a ribbon, topped with an enamelled cap decorated with bands of alternating opaque white and orange guilloché enamel on gold, with a row of rose cut diamonds running around the circumference. Chief Workmaster: Michael Perchin, St Petersburg, c. 1900. Previously in the private collection of Grand Duchess Anastasia Mikhailovna (1860-1922). Thence by descent. Grand Duchess Anastasia was born in the Peterhof Palace, the daughter of Grand Duke Mikhail Nicolaievich (1832-1909) and Grand Duchess Olga Feodorovna (1839-1891). She was the granddaughter of Emperor Nicholas I of Russia. In 1879, Anastasia married Fredrich Franz III, Grand Duke of Mecklenburg-Schwerin, in the Winter Palace. They had been introduced by the Grand Duke’s sister, Grand Duchess Maria Pavlovna (1854-1920). Her uncle Emperor Alexander II gave Anastasia away at the ceremony. Empress Maria Feodorovna described the Grand Duchess as “a darling, adorable as a rose’.